LS Cable's Chairman & CEO Christopher Koo (fifth from left) takes part in the ground-breaking ceremony of LS Cable's Submarine Cable Plant in Donaghae City, Gwangwon Province, South Korea. Fourth from left is Gov. 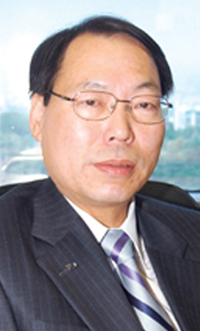 Kim Jin-Sun of Gwangwon Province. Far left is LS Cable's Vice President Choi Myung-Gyu. Lawmaker Choi Yeon-Hee of the Grand National Party (GNP) and Donghae City Mayor Kim Hak-Gi is also available. 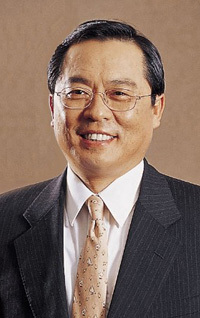 LS Cable (Chairman & CEO Christopher Koo) signed the contract with the Korea Electric Power Corporation (KEPCO) for the 330 billion won (some 239 million US dollars) worth of submarine power grid project on Feb. 5, 2009. The massive project, which connects Jindo (mainland) with Jeju Island via cable, will be completed by the end of 2011, according to LS Cable source. It is the largest such project in South Korea with a total value of 415 million US dollars, including converter system. This is the second power transmission submarine cable project in the nation after the Haenam-Jeju Island submarine power grid project (the first Jeju Island connection project) was completed back in 1997. As LS Cable succeeds in winning the contract for this project, it is the first domestic cable-maker to win a contract for a submarine power grid project in an international tender. It is meaningful in that LS Cable will be able to make inroads into the global submarine cable market which has been dominated by European companies. In addition, investments in the project will contribute to creating new jobs and revitalizing the local economy, as well as enabling Korea to play a lead role in future Northeast Asian Power Connection Projects. The project will provide an excellent opportunity to accumulate expertise in key marine technologies, including undersea exploration and deep-sea installation technology that will enable Korea to become a marine-industry powerhouse. LS Cable is planning to capitalize on its experience with this project to penetrate the global submarine cable market that is largely located in Europe and Southeast Asia, and to reinforce its product portfolio by developing submarine cables for Medium Voltage power distribution including 22.9kV as well as previously developed 180kV and 250kV cables. The only submarine cables used for power transmission are the 180kV submarine cables installed in the 101km section between Haenam and Jeju Island (96km sea section, 5km land section). This project was completed by France's Nexans (formerly Alcatel) in 1997. In addition, 22.9kV submarine cables for power distribution were installed at 21 locations including the section between Jangsan Island and Jado Island. This project is plan to interconnect the power grids of five Northeast Asian countries (South Korea, North Korea, Japan, China and Russia) that will enable far more efficient distribution of power, develop overseas power resources, reduce operating expenses and improve reliability. Some European countries as well as the U.S. and Canada have already built inter-connected power systems which enable them to share idle power. The tender for this project is the largest such submarine cable project in Korea and involves world-class cable manufacturers including Nexans of France and JPS of Japan. After several rounds of fierce bidding and extensive negotiations, LS Cable was selected as the contractor. The tender was announced on September 19, 2008 and acceptance of bids was closed on November 19. Then a three-step evaluation process was commenced that has involved technical evaluation (divided into performance guarantee and technical competence), price evaluation, and a comprehensive evaluation. LS Cable has been the only bidder to pass the technical evaluation. This project is the 2nd submarine cable project to address the power shortages experienced within Jeju Island owing to increased power demands. It will also improve consistency and reliability of power supply. Along the 122km section between Jindo and Jeju Island (105km sea section, 17km land section), one line, consisting of two HVDC (High Voltage Direct Current) cables and one communication cable, will be simultaneously installed in each direction. That is, a total of two such lines will be installed along this section. For the 105km undersea section the cables will simply be installed without any on-site connection. The connection between Jindo and Jeju Island is designed to ensure that power can flow both ways so that operations will not be interrupted even if one of the lines fails. Also, excess power will be sent inland from the renewable energy complexes of wind and tidal power that are now being developed in Jeju Island. As coastal areas are utilized quite extensively for the marine resources they provide, public grievances are likely to be encountered. For that reason the Jindo ~ Jeju Island section was selected at quite a distance from the existing Haenam ~ Jeju Island line to not only minimize the possibility that both lines might be disrupted simultaneously in case of some sort of natural disaster but also to address public concerns. LS Cable has chosen submarine cable technology as a key growth engine, so it has continued to invest in and develop the technologies needed to be competitive. Since 2004, LS Cable has been investing in its project to develop submarine connection accessories and HVDC submarine cable recovery technologies on behalf of the Korea Electric Power Research Institute. At the same time LS Cable has committed more than 20 researchers to develop 180kV and 250kV high-voltage submarine cables which were successfully manufactured and tested at the end of 2007. Also, in April 2008, LS Cable successfully completed Type Test for prototype designed products under the supervision of the Korea Electrotechnology Research Institute. LS Cable participated in the recovery of the failed submarine power grid between Haenam and Jeju Island back in 2006, and supplied 1km-long 180kV submarine cables and joints for repairs in December 2008. It has continued to accumulate submarine cable technology. 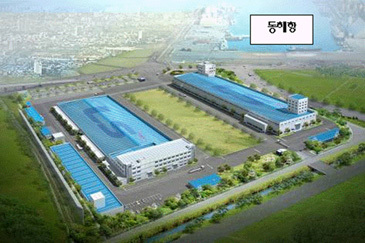 LS Cable started construction of a factory for submarine cable on a site of about 248,000m²(about 75,000 pyeong) in the Songjeong Industrial Complex near Donghae City, Gangwon Province investing KRW 130 billion last year. The plant will produce submarine cables starting in the first half of 2009. As submarine power cables are produced in lengths measuring tens of kilometers that weigh thousands of tons, the factory must be built in a location that ensures easy marine transportation. As submarine cables are exposed to a variety of threats such as damage by fishing, speedy and economical maintenance is crucial in case of an emergency. To address these issues, in close cooperation with KEPCO, LS Cable can maintain and repair the cables round the clock, and respond promptly to emergencies. LS Cable has established a thorough fault prevention and detection system which includes a real-time monitoring system. Submarine power cables are used to deliver power between countries or between land and islands. So far European companies have accounted for more than 90% of the market. The best cable technologies are integrated into this product so much that submarine power cable is considered the "diamond of cables." LS Cable was the 4th in the world to develop the MI-type (Mass Impregnated) 250kV high-voltage submarine cable. This cable accounts for most of the global market demand, but due to the high technological barrier, the market has been dominated by three European companies, Nexan (France), Prysmian (Italy) and ABB (Switzerland). To date, Korea has imported all its submarine cables. The global submarine cable market is growing rapidly by more than 30% a year thanks to European efforts to reduce the cost of power generation, expansion of offshore wind power generation and construction of nuclear power plants on islands due to environmental issues. Also, there are huge regional projects being undertaken that will require prodigious amounts of cable production, installation and follow-on maintenance. One of the projects is a long-term submarine cable network that is being built across the Mediterranean Sea that will connect North Africa with Western Europe via southern Europe and there is also another project in northeast Asia with ambitions to interconnect the power grids of five adjoining nations. Submarine power cable makes it possible to transmit electric power between countries or between land and islands. The most advanced cable technologies are integrated into this product. To stably operate the power grid, there is an increasing need for connection between countries, and between land and islands. Accordingly, a rapid rise in demand is also anticipated. AC (alternate current) power produced by a power plant is converted into DC (direct current) for transmission. The current is then reconverted at the receiving end into AC. DC power can be transmitted over a greater distance and in larger quantities than AC power while also losing less power. 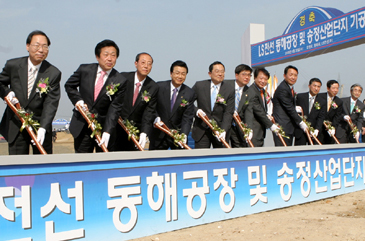 Start point : Jindo power converter station, Bongsang-ri, Imhoe-myeon, Jindo-gun, Southern Jeolla Province. End point : Jeju Island power converter station, Haean-dong, Jeju Island. The maximum depth of the sea between Jindo and Jeju Island is 160m. Average depth is 71m. The cable vessel uses a remotely operated vehicle (ROV) to install the cables while digging trenches 3m deep along the seabed. LS Cable will join hands with domestic and overseas partners that have ample experience in submarine cable installation.